I was traveling in the Boston area for Christmas and the airline lost my luggage so I had to go to Target on the way home to buy some essentials for the night. Good news really, as if I hadn't taken that alternative route home I wouldn't have passed that way and seen the sign. 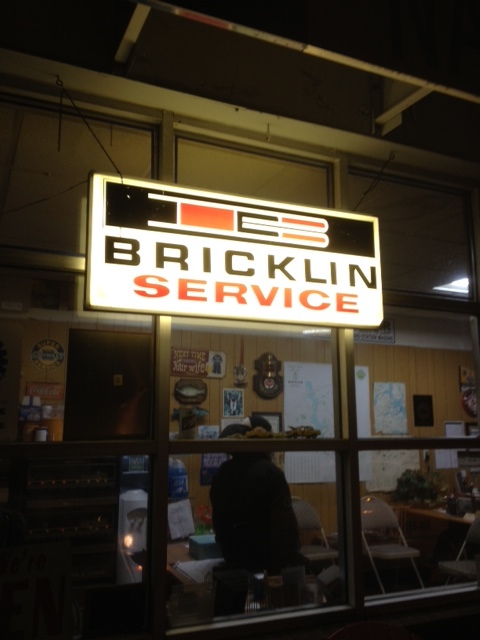 It would be an understatement to say that I was surprised to see a lighted Bricklin Service sign hanging outside an old gas station / service center! Unfortunately the shop wasn't open so I would have to inquiry about the sign's history at a later date. Best I could do was take a picture of it. I called the shop back on Monday and asked the guy on the phone if they knew about the sign. Fortunately he did. The man said he hung it about a year ago and that the sign was from an old dealership in the area. He said he knew someone involved with the original dealer and that he took ownership of the sign from them. He said he also had a Bricklin Parts sign, though did not own an actual Bricklin himself, just liked the sign. Editor's Note: On the Bricklin Dealership list, I show only one dealer in Boston: Clark & White, Boston, Massachusetts. Dealer code: 10503. This is very interesting, and many thanks to Richard Ractliffe for submitting the photo, and story.